The closing BCH price on July 23rd was 784.39 USD (Pacific Time), according to CoinMarketCap (UTC).The Coinbase exchange worked out a different number for midnight Pacific Time, 8 hrs later, which was 788.70 USD. This is a far cry from May 5th, when it hit a soaring price of 1728.64 USD -according to Coinbase- following a swift recovery after a prolonged decline from December 2017 and January 2018 (Coinbase). 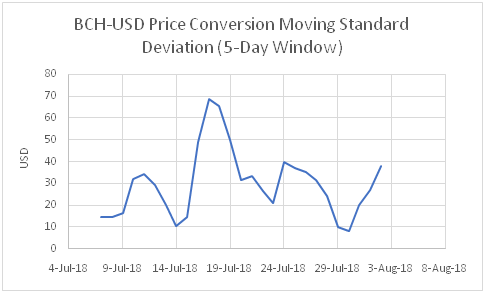 Based upon data from CoinMarketCap, from June 26th to July 23rd, the standard deviation for price, which may be used as a measure of volatility, was 145.5 USD. The image below shows moving standard deviation for this period with a window length of 5 days, i.e. each point represents the standard deviation for the price on that particular day along with BCH Prices for the previous 4 days. 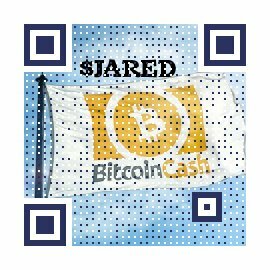 All CoinMarketCap data reported is for Coordinated Universal Time (UTC).